It is not often a report appears in the Journal under the above heading, but we are still in existence, and the number of special meetings that have been held during the past half year, to combat local grievances, shows that we have not been idle. Perhaps the activity may be accounted for by the system of pin-pricking which some of our members have been subjected to for a long time by petty officialism. Our members- have decided that it must now cease. The trade union spirit prevailing in the branch is of a better quality than I have ever known it before ; it is even permeating some of the “ nons " they can see phantoms of trouble ahead. I don't know that they have anything to- fear, as they are always conspicuous by their absence when there is anything to be done to better their conditions of service, but they are first in the field to- gather in the fruits of someone else's labour. At our monthly meeting, which had been postponed from June 1st to the 8th to enable Brother Marshall, of Eastbourne, who represented our group at the Leeds Conference, to attend and give a report of the business transacted. Brother Marshall's report, which kept him on his feet for fully one hour and a quarter, proved highly educational and interesting to everyone present. What was lacking in numbers was made up in interest. 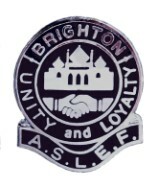 Duty accounted for some absentees, but it would please the branch officials if some of our sleeping members would turn up- at the meetings and help with some of the spade work that has to be done, and not leave their destinies in the hands of someone else. A few had been affected by the " fusionia " which has charged the air round here of late. But after Brother Marshall got through the correspondence with the N.U.R., over the electrification on the London, Brighton and South Coast Railway, I think the spirit of "fusion" must have met a premature death, as when Brother Marshall reached that item, there was nothing to be said or questions to be asked. A hearty vote of thanks was proposed to Brother Marshall for the able manner in which he had rendered his report, which would have been longer had not time been so relentless and the appetites so keen. Brother Marshall replied. At the close we had the pleasure of welcoming four new members. We have ample room for the rest of the " nons " when they can drop their apathy, get off the fence and put their shoulders to the wheel and help to work out the salvation of the locomotive-men.